Such a tiny game, such an impact in so short a time! Great work! One of the greatest bitsy games i've ever played. The atmosphere and the Old Ones theme make this one real special in every detail of it. Interesting concept and good use of atmosphere! To quote a legendary children's TV character, "I hates eyeballs!" And this game is another fine example of why I too hates 'em! This is short but sweet(? ), and even though there's less than 5 minutes of gameplay (depending on how long you pore over every sentence), it's something that stays with you! Every screen traversed made me feel more uncomfortable until we come to the game's conclusion. And I still feel uncomfortable just thinking about it. Brrr. REAL GOOD. There's an interesting inversion of "cosmic" "horror", both in the direction people look to find the unknowable, and the way it makes one feel. The concept of the "sublime" is an originally Romantic term to refer to the feeling of insignificance in the face of something incomprehensibly vast, and imparts both terror and joy but, where many explored the idea of vast lifeforms as an extension of that terror, this is an expression of acceptance, curiosity, and ultimate love (in spite of or even BECAUSE of how alien it is). I like it a lot!!! Really well done! The art was beautiful and it was surreal and creepy enough to make an impression. Thanks for making this! Didn't feel like horror to me. I was perfectly fine with it. That's okay, it's important to acknowledge that different people are affected differently by different things. I hope you at least enjoyed the experience. this is amazing! well done. I don't even know what the heck is happening. Fun 2 minute walk through an odd departure. Sorry about the audio, My mic was not set correctly and it sounds muffled. follow me on twitch and twitter for notifications. Bring games you love and/or you make for me to play! This might be short, but man is it something else. It's incredible how you made such a dreary atmosphere with minimal graphics like this. Gorgeous art!! The visual atmosphere is incredible. I'm more confused than anything. It could have been creepy with a bit more context; this was just odd without any. This is short, creepy, and interesting. It has fitting music, art, and mood even for such a short experience. That's really good! Wow! I love the art done on the game! And as an creepiness enthusiast I loved the eerie vibe to the whole experience! This is so gorgeous and creepy! The fact that you have to propel yourself forward to continue the story puts you, the player, in the same position as the character - of being enticed toward some other-worldly doom. That wasn't very creepy but the visuals were nice. Oh sorry you didn't find it creepy. I guess not everyone is affected by the same stuff. Thanks for playing, and I'm glad you enjoyed the art. This was an awesome little horror experience. I really enjoyed the pixelated style, as well as the models used in the game. It had some really well implemented creepy triggers to put you on the edge of your seat. I really wish there was more of this! It is hard to say what this game is about outside of the obvious transcendence, it really makes me wonder why. This is a game that reminds me of what I like to see in these old fashioned games, these games define an old genre, and make it their own. Excellent job! Is there something here that im not getting? 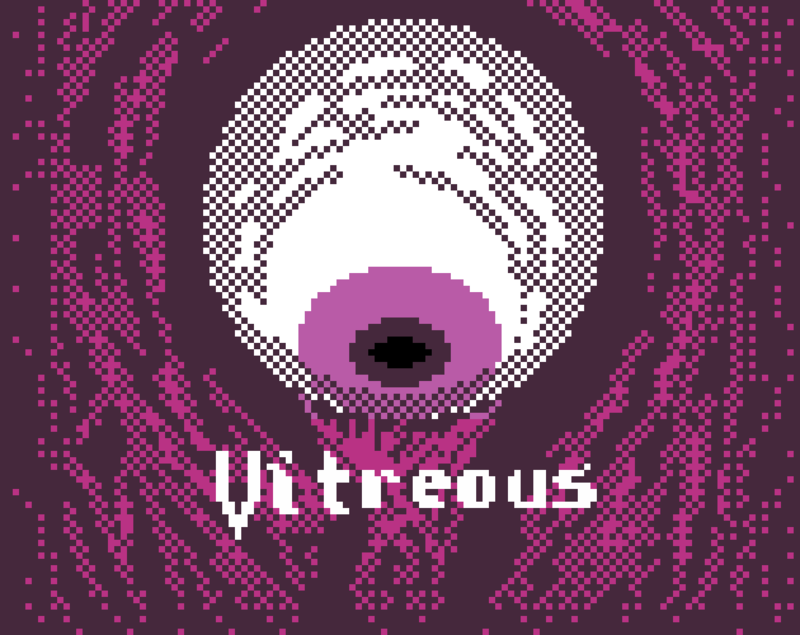 Its just text saying Vitreous and im not able to do anything... have i been trolled? Same I have no idea how to start. Click the screen, then hit any of the WASD or arrow keys. It should work fine. Very good! Creepy, interesting, beautiful. The visuals are amazing and the music does such a great job of setting the mood. This looks fantastic & is so eerie. Great work. THIS IS SO GORGEOUS!!! WTF U ENBY WITCH!!!! FRICK!!! ITS SO GOOD AND CREEPY AND WOW!! !